Reggie, like many people, adores seashells and has collected them for as long as he can remember, Dear Reader. When Boy and I are on vacation at the shore we often stop in at stores that stock and sell seashells and related curiosities, and we buy a few specimen to add to our collection at Darlington House, as a souvenir of our trip. Since we acquired Darlington in the late 1990s, we've displayed our collection of seashells on the fire-surround in our dining room, arranged by Boy in a most artistic fashion, reminiscent of how such collections were displayed in the eighteenth and nineteenth centuries, here and abroad. 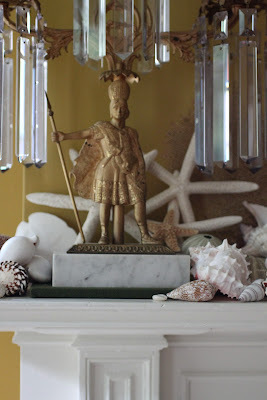 We only display our seashells on the dining room mantel during the summer, when the weather is hot. 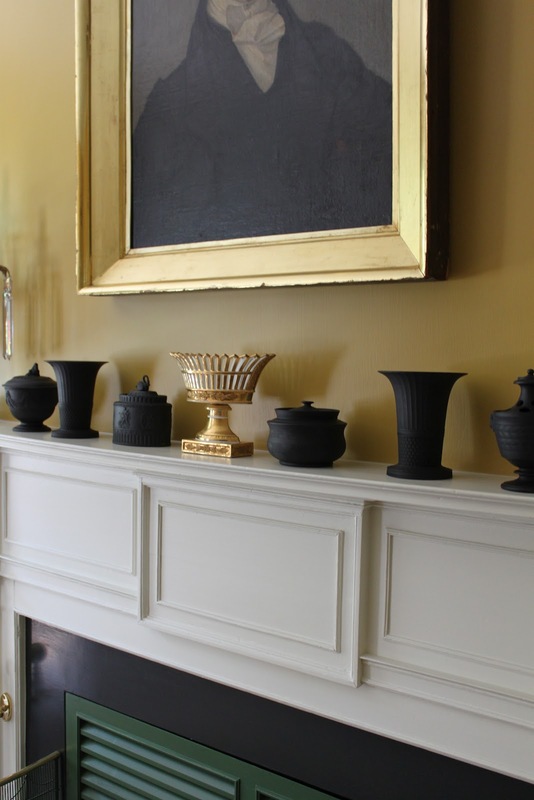 Most of the rest of the year, with the exception of Christmas, we have a somber and severe arrangement of basalt vessels on the mantel. 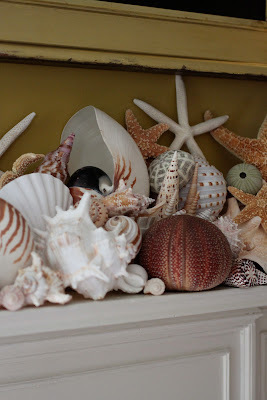 I used to arrange our seashells on the mantel, but I surrendered that role to Boy years ago (along with arranging flowers and decorating Christmas trees) because, well, he is so much better at these sort of things than I am. It is a careful, and carefully considered process of layering . . . The practice of collecting and displaying shells as we do became fashionable in the seventeenth and eighteenth centuries in Europe when a mania swept the cultivated Western world for exotic seashells. Known as Shell Mania, or Shell Fever, or Conchylomania, it rivaled the earlier and more infamous Tulipomania. Shell Mania was fueled (and made possible) by the colonial trade that was then exploding among European nations and the Far East and the West Indies. Shell Mania became popular here in the United States after the Revolution, once our new nation entered into independent trade with the Far East. The finished arrangement, how beauteous to behold! More information about the history of Shell Mania can be found in a fascinating and scholarly post titled Conchylomania, written by James Grout, that appears on his fascinating blog, Encyclopædia Romana. Another excellent source of information regarding this esoteric subject—the history of the collection and display of seashells—is an article written by Richard Conniff, "Mad About Seashells," that appeared in Smithsonian magazine in August, 2009. Arranging seashells, as Boy did on our dining room mantel at Darlington House, is not without challenges. The shells are, in some cases, delicate, and when arranged in layers, as he does, can come tumbling down if the display is not oh-so-carefully assembled. Isn't Boy's Shell Mania arrangement pretty, and summery, and enchanting, Dear Reader? Tell me, do you also collect and display seashells at your house? Finding the outlines of fossil shells in the limestones of my childhood home started me off on a lifelong love of shells. Trips to Florida on school vacations resulted in my wheedling my parents for money to buy a giant clam shell and a large conch. Both have decorated the bathrooms of every home I've lived in since. Leaning to scuba in the Western Pacific in the 80's really put my collecting in high gear, though. I learned the shells to conserve by admiring them and leaving them in place. And I only brought up already-broken corals. Even though my collection now fills a Victorian 3-shelf store display case and an antique secretary bookcase, I can tell you where every one came from. The first cone shells I collected, I tucked into my dive jacket's pocket. I wondered why I got a slight tickling from them until I surfaced and discovered they were equipped with stingers. These were small ones referred to locally as "blood mouths" because of the red coloration around the opening. Thankfully, they were too small to do any real damage. I even have a few specimens from the Red Sea and the Arabian Sea. The artistic arrangement of your shell collection by Boy deserves an award. The variety and abundance so beautifully arranged around existing treasures enhances the still life. At our Florida home I have some shells which hold special meaning. I suffer terribly from Shell Fever, which spikes while we are at St. George Island every summer when I succumb to "sheller's stoop." Boy's mantle display is spectacular! I'm afraid I'm more given to tabletop bowls and plates with shells sorted by types. My favorites are the olive shell and the prickly cat's paw. Thanks for providing some interesting history about Shell Fever, Reggie. I am a big fan of shell displays, especially in the summer or in Florida. I don't have any coral, however, and have to live with substitutes whose finish I have "helped" a bit. I too love seashells Reggie. Most of mine are displayed in blue & white bowls a few in vignettes! My wife and I are sea-glass collectors...always hunting the elusive blue sea glass! I love how the shells and related items look on your mantel. oh yes, Mother Nature's works of art. I only have a handful and have them distributed throughout the house...your collection inspires me to do a more artful arrangement. Boy is so clever, I wish I had him at my house. I have the odd shell around the place and some sea glass in the bathroom. I have never seen them displayed as you hsve them. They look sensational. When I was a child my grandmother had an enormous clam shell in her garden. They seemed to be popular in Sydney then. I love the faceted prisms on your candelabras (wrong word I know), actually love the whole objects. Your shell arrangement is magnificent. I do have bowls that hold small shells that my children collected on family vacations. My favorite shell display is a shadow box containing a few shells that they collected with their father shortly before he died. I like both your arrangements, (the sparse basalt display), and the shell confection. I can easily imagine how delicate the latter is, and not something to do when there's a duster around, (as in my house). My main task is "straightening" items that have been moved in table arrangements by my duster, (and in this case, my duster is a person). Well done Boy - lovely effort and a whole new luster from your lustres at night, I imagine. Its quite magnificent, you two live so beautifully Reggie. As a boy I had what I called my museum; a shelf of various objects I came across that interested me. A display of exotic shells formed the star exhibit. I found them in a shoe box in my grandmother's house after she died: she must have collected them on her travels around the world in the 1920s and 1930s. This is my first visit! I found you via Meg's blog...Pigtown. So delighted to learn about shell mania....I never knew. I have been collecting shells and corals for a while. Your red coral is exquisite and quite large!! I've only seen small pieces...usually as jewelry. And, I love your basalt ware collection. Are any by Wedgwood? Engine turned? Wonderful collections! Currently, I do not display seashells at my house. However, after seeing Boy's artful arrangement, I just may have to rethink my "summer" mantel! 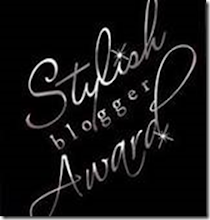 Btw, I'm a new subscriber to your blog and I am really enjoying it--I love the personal tone! Beautiful and so worth the effort! I absolutely love shells in the summer too, but have never attempted anything on this level-so inspiring! If you ever encounter the toppling issue again, use those little wax disks that are typically used for steading candles in their taper cups and press them between the larger shells. Happy Anniversary to you & Boy! I just love the photos in this post. I don't have a lot of things sitting around in my home but this really appeals to me. I spent each summer in Cape May and loved, loved, loved collecting shells and as I get older, the memories of youth become sweeter. Maybe I'll find a glass apothecary jar to hold some shells...that would fit with my clean and simple decor. Thanks for the inspiration. What an absolutely stunning display! Thank you for the education. I had no idea shells were displayed in such a fashion in the 19th century. I must procure a copy of the book you mention in your post to learn more. Also, I adore your regularly displayed mantel too. It is a reverse of my own (check your mail box to understand why). You must write a post on Basalt one of these days. I'm certain your readers would enjoy such a post. Thank you and Boy again for spreading the beauty of the seashore in such an original way. I was literally holding my breath looking at the shell arrangement for fear it may tumble to the floor if I dared to exhale! What a wonderful job Boy does. Anytime you find yourselves in Marblehead, please stop by - I have 3 mantels begging for decorative touches! Beautiful! I am new to your blog and am so happy to discover it! This is beautiful and instructive -- people so often skimp. My motto is use what you need and then add a little more. Certainly applies to flowers and as you've so beautifully shown, to shells. Did not know about the shell museum in England and am putting that on my list! Beautiful shell collection and Boy has done a marvelous job on the display. My shell collection, both personally acquired (by way of the "Sanibel Stoop") and purchased, was packed away many moons ago when a little one arrived in my home. I vowed to display them again only when I could put them behind glass, thus no dust collectors. Two prized ones were given to me: one is a calcified (that may not be quite the right word) scallop shell found embedded in the kaolin pits around Macon, GA, and I was told that was an indication that at an earlier point in time the ocean came as far inland as Macon, and the other shell came from someone who personally collected it off the coast of Venezuela. I believe it is called a Music Volute. The old gent was a jazz musician on a cruise boat in the area (1920's or '30's) and he found it when diving in his free time. It may be fairly rare. Thanks for the interesting shell history references. You certainly know how to "shell it out" ~ Love to see how all these marvelous specimens are stored away when they are dismantled. Lovely post! I keep a tiny collection of shells from La Jolla and Cape Cod on my desk to remind me of happy times. city cemetery was a place visited often with your Grandmother and friends. One of my best friends had a beautiful family plot. The grave of his aunt "Little May" that died at 3 years of age was encircled with interesting shells collected on a trip to Cuba by her parents. We would pass the time arranging the shells in different designs. It was a happy time not sad. Hello Reggie! 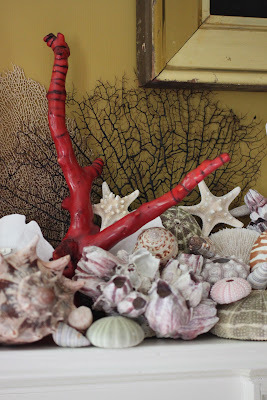 I'm totally crazymad for Boy's shell arrangement and I've had to put some of the images in my i-photo scrapbook. I do hope you don't mind. Just for my own pleasure and perhaps for drawing/painting reference. I absolutely love the photos & the idea of changing the decor on the mantle by the season dahhling! I will tell you know, I will have to steal that idea at once! I tend to be a stickler for keeping what works in place all the time but your post & the beautiful images of Boy have inspired me to rethink that approach. My mantle at home is static much of the year. Occasionally something will get added or taken away but for the most part it remains the same. On the right side is a beautiful, red sea fan with a large sponge and conch shell. On the other is a collection of three butterflies in a narrow frame fronted by a potted orchid. An off kilter pinyon pine cone (found in New Mexico) completes the arrangement. I used to have more shells grouped on the mantle but our cat took great pleasure in knocking them off. Centered between the two ends are a couple of framed antique maps. 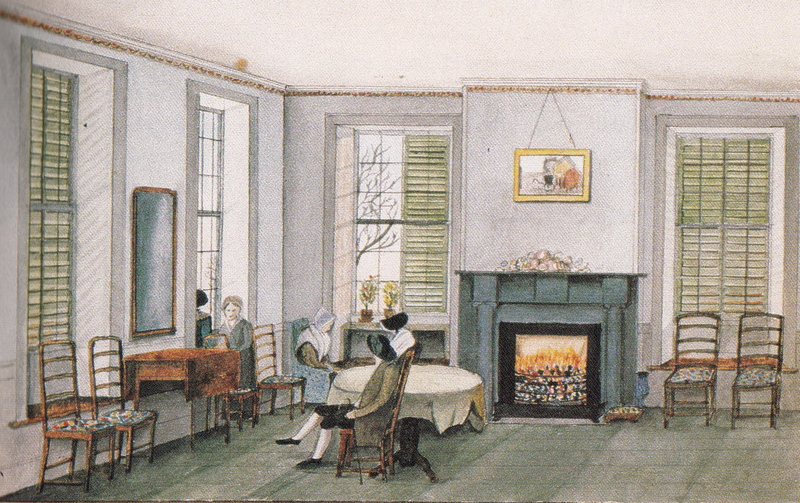 The large one is hung while the smaller one simply rests on the mantle and rests against the other.